It is not a coincidence that all the games reviewed this month begin with the letter A. You may have noticed that during the month of December I was adding a new feature to the catalogue section with screenshots and brief descriptions for different Public domain games I have access to. In an attempt to have some order to the madness I am working my way through the collection in alphabetical order and therefore had the delight in playing 80+ games all beginning with the letter A. This trend will continue next month as I move onto the letter B. Anyway back to the review. The first game to be reviewed this month is Amiga Laserzone. Now I seem to recall this game getting a bit of a hammering when it was reviewed in the public domain press. I seem to recall the game only receiving 2 stars in an Amiga Power review. The reason for its low score depends on whether you played the original Jeff Minter game that it is inspired from. If you have played the original you may find the game an uninspiring update with little new added to the original 8 Bit game. If however you are like myself and play the game for the first time you will find the idea of controlling two space ships at the same time as quite novel and interesting. It certainly makes the game play manic and causes you to think differently to other shoot em ups. Overall this game isn't going to be an all time classic but looking back I think it deserves some credit for promoting a different game play mode to the ususal one ship horizontal or vertical shoot em up. It still seems to be fresh and it is a shame that more game developers didn't take more risks in challenging the shoot em genre during the Amiga's lifetime. Then again the same seems to be true of FPS on the modern consoles but that is a discussion for a different website. The Chaos Engine was one of my favourite Amiga games. It was fast paced, had great music and graphics. Alien Bash II is a clear tribute to this game. The game is played over eight levels and the aim of the game is to rescue prisoners. The game certainly holds its own in terms of presentation. The graphics are some of the best I have seen in a public domain game and would not look out of place in a Bitmap Brothers game of the 1990's. The game includes weapon upgrades which are purchased from the shop. To obtain money simply kill the aliens and collect their skulls. You may also find some money littered around the levels so keep a look out. As you collect new weapons you can cycle through them by either pressing F4 or pressing the second fire button on the joystick. The weapons available include; Plasma gun , rocket launcher and a grenade launcher. Great fun can be had with all of them. As with most PD games it is unlikely that you will read the instructions and will tend to plunge straight into the action. One thing worth noting is the functions available by pressing F1 or F2. The first will cause your character to stop whatever they are doing and remain rooted at the spot so that you can rotate around the 8 joystick directions firing at the enemies as they surround you. If you need to run away then press F2 as this will enable you to run and move but surely this is the cowards way. Overall a good, professional and great looking game which succeeds in having its own identity despite borrowing heavily from an existing commercial game. If you enjoy Alien Bash 2 why not try the first game Alien Bash. The graphics aren't as polished but the gameplay is similar. Little did I know last month's game of the month choice would cause such controversy? Before reviewing this month's choice I feel it is necessary to address two of the issues raised. Firstly some readers stated that Quik and Silva was not a public domain game and secondly some readers also believed that the game could not be a game of the month because it was not a new or updated game. In terms of the first issue I believe Quik and Silva is public domain. It was reviewed as public domain in many Amiga Magazines including; Amiga Power (October 1992), Amiga Force (Mar 1993) and Amiga Action (Oct 1002). I also obtained my original copy of Quik and Silva from either 17Bit Software or Virus Free Public Domain library back in 1992. In response to the last point raised, the primary aim of this site is to bring public domain games from the 1980s and 1990's back to the public attention. It seems madness that commercial games released for the Amiga during this time are easy to locate and download within seconds on the internet whilst the public domain games appear almost invisible in comparison. Therefore the game of the month is chosen by AmigaPD to reflect the best game which was played during that month regardless of whether it is a new game or an old forgotten game. In future months, new Amiga games may be reviewed but just because they are new should not mean they automatically receive the coveted Game of the Month Award. Rant over and time for the review for January's game of the month. It is Aquanaut and yes I know it was originally released as licenceware by F1 but the game's author (Phil Ruston) has made this game available for download on his website (http://www.retroleum.co.uk/my-old-games/). Enough of this controversy lets just get on with describing the game.The game is an update of the programmers Commodore 64 game called "Shark". What is Shark? Well that's the name of you submarine which you have to guide through numerous mazes. These mazes are the underwater headquarters of Atlantic HQ which have been temporarily overrun. Your task is to guide your submarine through the levels attacking the enemies and avoiding your own sides defence mechanisms which are now wrongly targeting you as an invader. You start the game with quite a low powered weapon but don't panic you are soon able to obtain upgrades. These can be accessed by using the function keys. 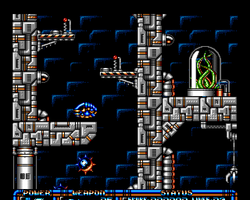 If you have auto fire on you joystick you may want to set it to on to unleash a constant stream of bullets but this game is often described as more of a thinking man's shoot em up as the game is not swarming with enemies and the levels mainly involve you thinking about how to avoid obstacles and what you need to do to access new areas. Overall, the game has polished graphics, solid controls and lovely presentation. The author stated that he had hoped to release the game as a budget title and I definitely think this game could easily have succeed as a budget release. If you have never played this game then take advantage of the author's generosity in making this game available for download. For those of you who did play this game back when it was released, why not download it and relive those memories. I am sure you will agree that the game hasn't aged badly at all and is still an enjoyable play.